I primarily make items to be used alongside Shamanic work, but I reserve the right to deviate when creative inspiration strikes. Here are some examples of the things I make and sell. Custom work is my favorite kind to take on, but I also always have some project underway and often have various items on hand to sell. You can find the items I have on hand at my Etsy Shop. Rhythmic noise – such as drumming, rattling, or tapping sticks – is know to alter brain waves in such a way that humans can more easily connect to spirit (sometimes referred to as an “ecstatic state” or in more modern terms a brain wave theta state). These rhythm sticks were made from alder wood. Alder has many sacred meanings across cultures, such as being a sheltering or giving tree and serving as a reminder that we have hidden talents within us. The symbols on the sticks were burned in, a reminder that fire is transformative. The majority of the symbols chosen are ancient and familiar to cultures on all seven continents. Each stick is a reverse image of the other, reminding us that there is no light without dark and representing balance in the universe. 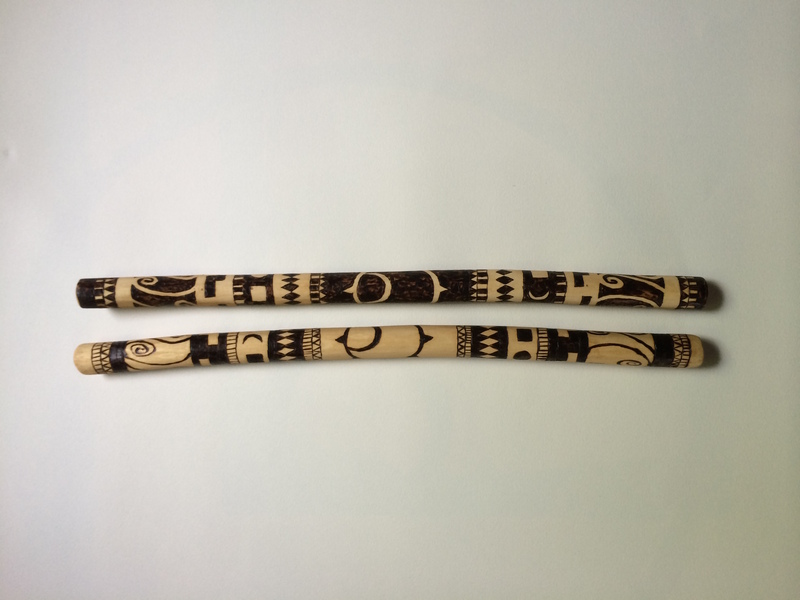 When you use these rhythm sticks let them serve as a reminder that we are all connected and let this knowledge guide your intentions. The crow, from the corvid family of birds, is known to be one of the most intelligent beings on earth. There is no shortage of meanings attached to this bird, however when this rattle was made it was with the understanding that this bird has carried itself forward with man and flourishes in its environment. No matter how inhospitable the landscape may seem we have the wisdom, as does the crow, to change our circumstances for the better. 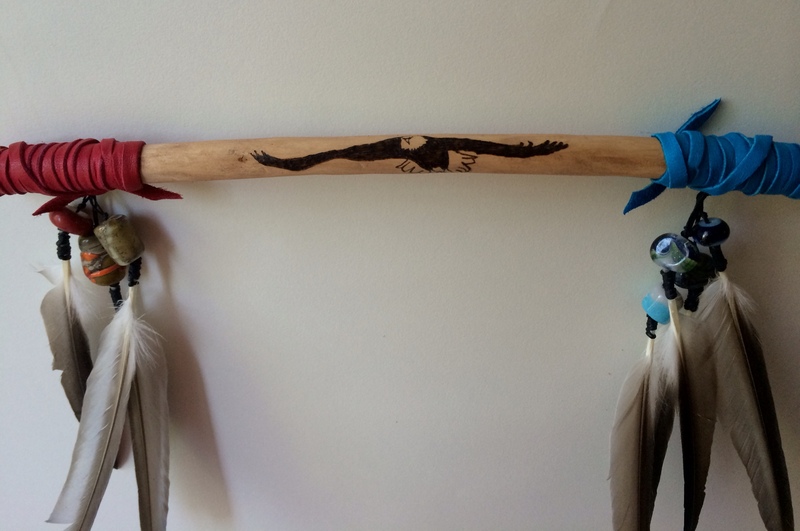 The head of the rattle, made from elk skin, is painted with the silhouette of a crow about to land. The head is attached to an alder stick. Alder has many sacred meanings across cultures, such as being a sheltering or giving tree and serving as a reminder that we have hidden talents within us. Dangling from the neck of the rattle, wrapped in leather, is a feather; at the top of the feather is a hand made glass bead (torchwork), that I made to be reminiscent of the night sky and the mysterious cycles of the moon, something the crow is also known to be associated with. This talking stick is made from alder wood. Alder has many sacred meanings across cultures, such as being a sheltering or giving tree and serving as a reminder that we have hidden talents within us. Burned into it is the image of the eagle representing the highest of ideals and honor – a bird that touches the skies and those beings that reside there. On the left hand side of the stick, which is wrapped in red leather, are three beads in earth colors and tones – metallics reminiscent of the minerals in the earth, the red and orange colors reminiscent of the core of the earth and the ground itself. On the right side of the stick, which is wrapped in blue leather, are three beads with colors and forms reminiscent of our sky, the constellations, and the vastness of the universe. When you hold this talking stick let these symbols and images guide you to speak only the truth, and to form your thoughts and words with the utmost sincerity and with the highest of ideals that are for the greater good of all. Let it serve as a bridge between you, on earth, and the benevolent spirits that honor you by listening. 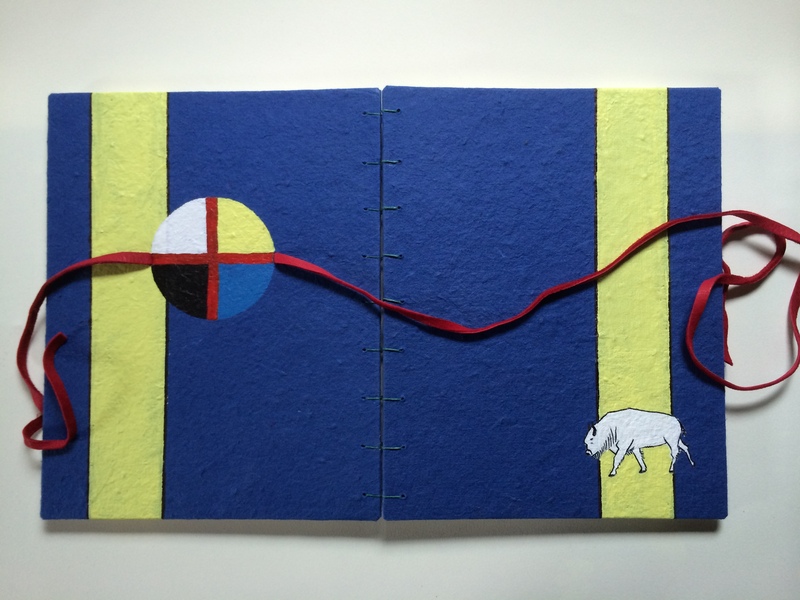 This journal was hand bound using a coptic binding. Coptic bindings are some of the oldest known bindings (from as early as 2nd century AD). 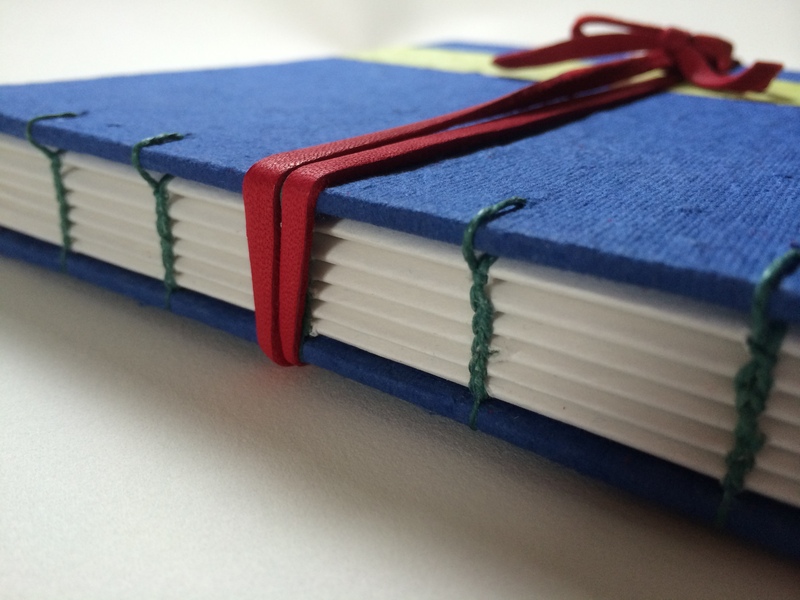 The beauty of this binding, besides its simplicity and lack of glue, is that it allows the journal to lie flat. This makes it ideal for not only writing in, but drawing in too. 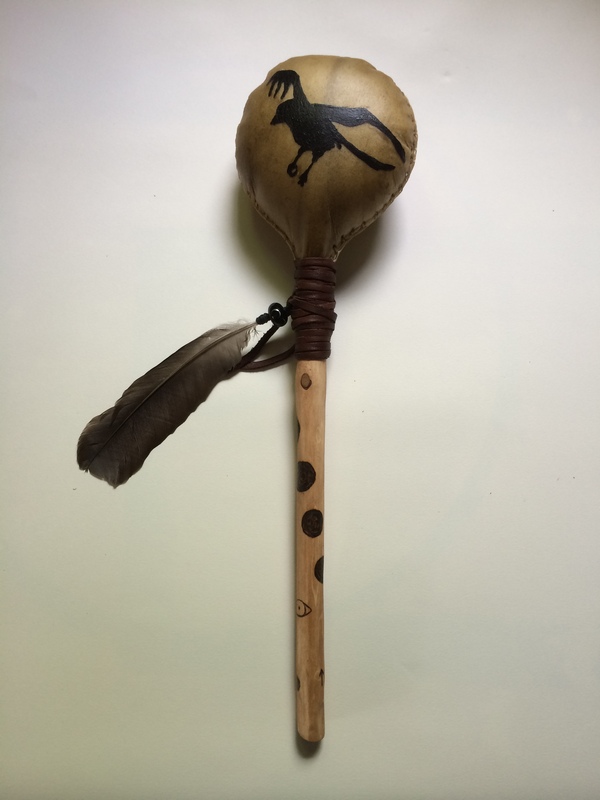 This rattle was created for a fellow Shamanic Practitioner. Her primary power animal is Bear, hence the bear paw on the head. The handle of the rattle is divided in three sections, representing the lower, middle, and upper worlds. Through these worlds threads the tree of life, where three sacred leaves hang: oak, ash, and thorn. Also threaded through these worlds are silhouettes of animal spirits that are important to Kate: Bear, Owl, two Wolves, and Hawk. This rattle started with the handle. In the midst of studying some Celtic Shamanism, I decided to make a rattle to honor the Irish Goddess Brigid. Brigid is known commonly as the triple Goddess; Maiden, Mother, and Crone. I decided to represent this Three using the moon in phases of waxing, full, and waning. This symbol is burned into the handle of the rattle, which is made of sacred Alder wood. On the back of the handle is a transliteration of the name Brigid in Ogham, which is an ancient Irish alphabet. Much to my delight a colleague of mine later journeyed to find her personal power symbol and when she shared this with me she had drawn the same three-moon phase symbol I had recently burned into this rattle handle. Even more wonderful is my colleague’s personal devotion to the Goddess Brigid. So this rattle was destined to be hers! Since Brigid is also known as the Goddess of Swans and Poetry, my colleague requested a swan be worked on to the head of the rattle. The one I painted onto the head, made of Elk hide, was designed off of the Swan door-pulls from St. Columba’s church near Drumcliffe, County Sligo, Ireland; a place my colleague had visited.